I have grown increasingly cranky regarding the state of “Spider-Verse” over the past month or so, finding the narrative to be lacking any forward thrust and the tie-ins to be either superfluous or overindulgent. So I was obviously quite curious about what was awaiting me this week with Amazing Spider-Man #13. 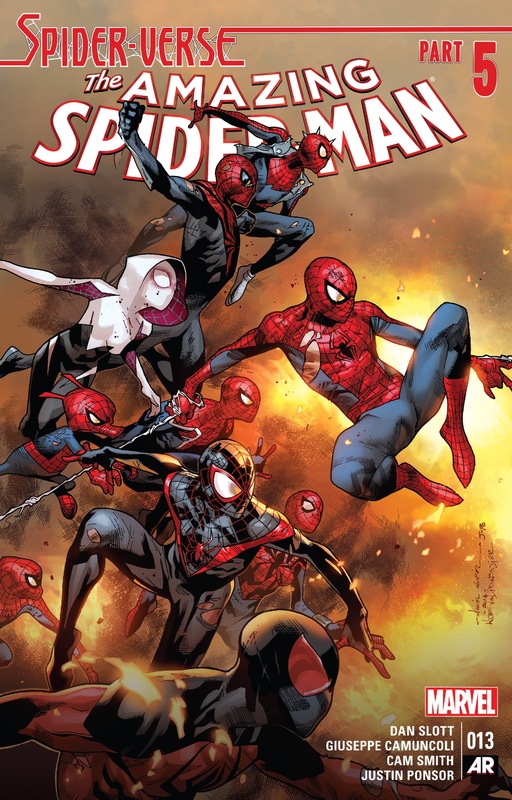 As the penultimate chapter of this very long-running storyline something was going to have to happen in this issue that would finally paint a clearer picture of where we’re going to be once the dust settles on “Spider-Verse.” I mean, at least that’s what one should assume. Maybe yes, maybe no. ASM #13 is certainly an improvement over its predecessor, but that’s akin to celebrating the existence of Rocky Balboa because it is at least a better film than the abomination that is Rocky V. Now that I have completely alienated all of the non-Rocky fans who read this site, let me just clarify this whole spiel by saying, ASM #13 is more coherent and better organized than ASM #12, but I’m still having some major problems with many of the themes and ideas being put forward by Dan Slott and his collaborators in “Spider-Verse,” and I don’t foresee some kind of magical wand being waved that’s going to prevent me from thinking that this entire event was just another disappointment from a book/creator that has been delivering far too many of them as of late to be celebrated as some kind of modern day incarnation of Stan Lee. But let’s deal with the here and now and worry about the legacy of this arc or its creator later. In terms of why I have such an issue with “Spider-Verse,” it’s that this story continues to shockingly lack a central thesis – i.e. what is this whole thing about? Initially I thought this book was going to undo some of the damage that’s been done to Peter Parker’s character since his return from the dead by establishing him as the one “true” Spider-Man – this is the guy who has been the star of a series that has been publishing for more than 50 years, right? I thought all of these alternative Spiders were just window dressing that would add some fun and flair to the story of watching how Peter is able to succeed where everyone else before him has failed (remember, he is the ONLY Spider to successfully defeat an Inheritor – twice, mind you). And yet the book continues to service this idea in name only. 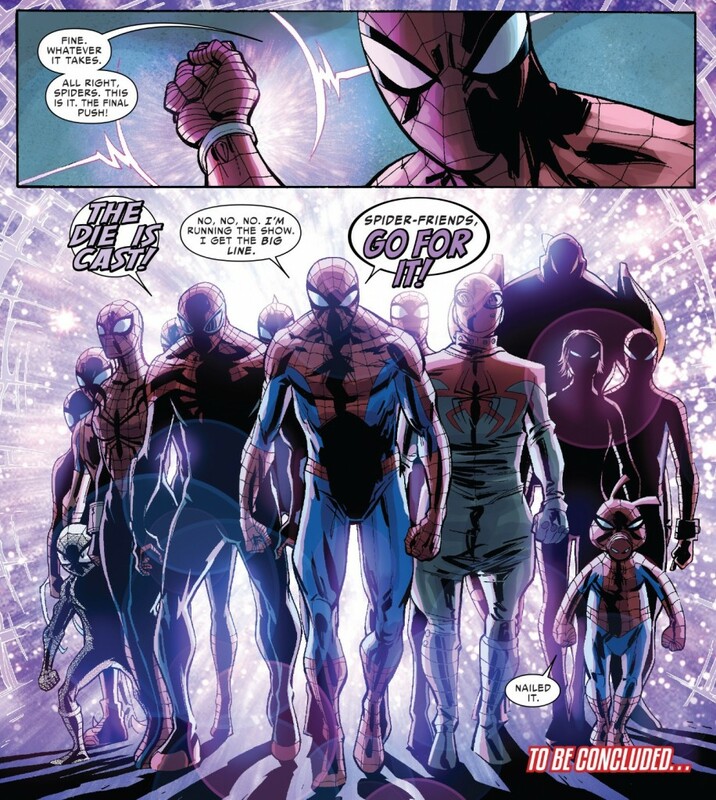 It tells the reader that Peter is the leader – he gets the big “go team go” line at the end of this issue which he allegedly “nails” per Spider-Ham. But he has still done little to nothing to distinguish himself from the countless other Parker analogues found throughout this story. ASM #13 opens with that long-awaited “hope spot” I had been clamoring for two weeks ago – Jennix’s clone plant has been destroyed – but even that takes place off-screen in a series (Scarlet Spiders) that doesn’t star Peter (PS, the endless amount of cutaways still continue to kill the narrative flow of this series).. 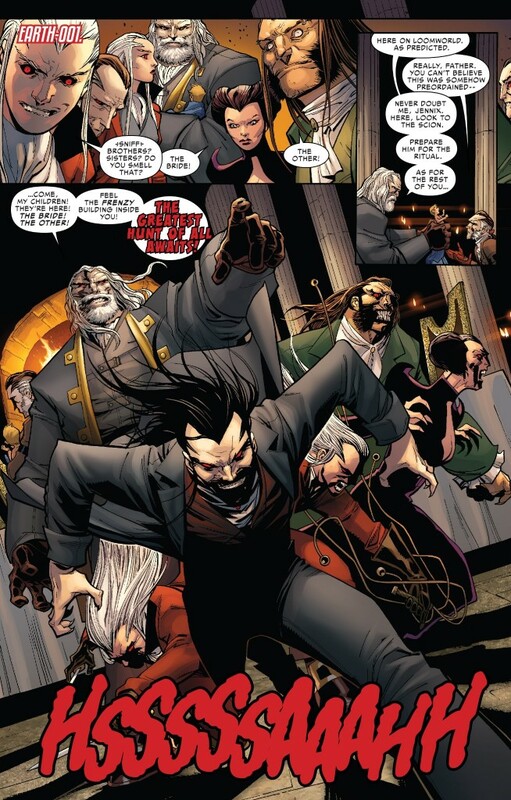 The group has obtained a bunch of scrolls (still hate that secret scrolls are a plot device) that will allegedly provide them with some insight as to how to defeat the Inheritors, but Spider-Woman is the one who risked her life to get those scrolls and Anya Corazon is the only one who can read them. The Inheritors finally lose a bigtime part of the family in Solus but it’s Kaine that delivers the killing blow. Peter is still just an idle observer. There’s even a scene where the comic’s text explicitly spells out that 616 Peter is not that special. Spider-Man India is moping around talking about how he’s just an analogue of the “real” guy and Spider-Man UK comes around and tells him (paraphrasing here), “hey we’re all special.” Maybe if these words actually came out of Peter’s mouth, it could be viewed as inspiration via leadership. But no, Peter remains passive, awaiting word from the others and still not developing a concrete plan to save the Spiders from extinction. Hope is not a plan. For the icing on the cake, the issue’s big emotional moment involving the Uncle Ben totem comes courtesy of none other than Otto Octavius, the Superior Spider-Man. As Peter sits there trying to talk Ben into suiting up for the Inheritor battle to no avail, Otto is the one who lights a fire under him with a really interesting speech about needing to succeed just once. What makes this speech so intriguing is the number of different ways it can be interpreted. On one hand, it’s the standard superhero, never give up speech. It feels like something Peter might say. It also echoes what Uncle Ben said to Peter during the dream sequence in Amazing Spider-Man #700. All the same, the succeed just once premise could be taken from the perspective of a supervillain. Otto as Doc Ock, was defeated countless times by Spider-Man. 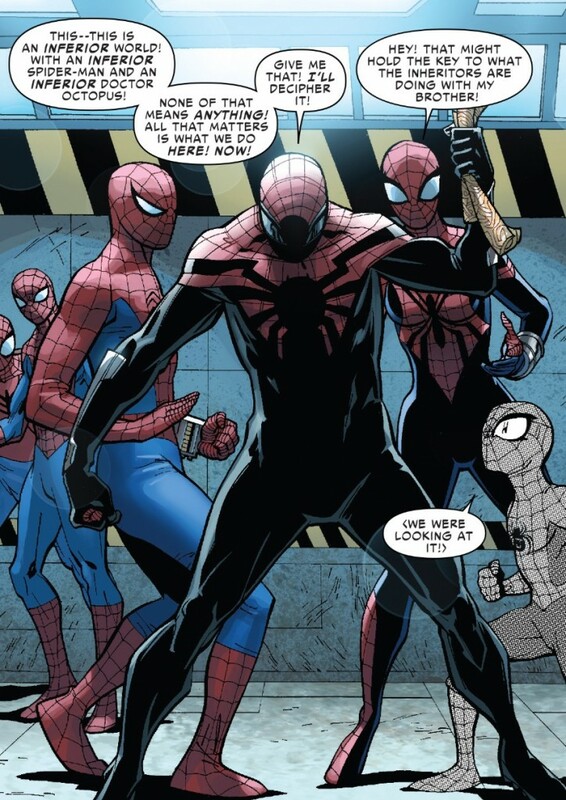 But he only needed one time to win, and he did, and thus he became the Superior Spider-Man. But here’s the rub. So essentially in the very same comic book where Otto discovers that he loses the war for Peter’s body (aka, the last two issues of “Goblin Nation”) AND an alternative version of himself made a miscalculation and nuked the planet Uncle Ben Totem was living on, he has the clarity of mind to give this very impassioned rallying speech to Ben? That just doesn’t add up. And if Slott’s intent was that A+B really does = C, he didn’t do a terribly effective job building to Otto’s come to Jesus moment. Where’s the bitterness or moment of reflection from Otto? In fact, if you go all the way back to Superior Spider-Man #30, we still haven’t had an adequate moment of reflection from Otto about what transpired in “Dying Wish” and the first 95 percent of Superior. Either way, perhaps what all of these plot points indicate is that my theory on what “Spider-Verse” is supposed to be about was all wrong – there is a theme, it’s just a theme I don’t particularly like or care for. That’s a very fair point. My only counter to that is if the central thesis to “Spider-Verse” is “everybody’s a somebody” in this world, how does that make me want to continue to read comics that star Peter? I guess if Marvel is going to publish 80 different spinoff series starring all of these alternative Spiders, there’s a long-range goal in mind with this approach. Then again, with word that the Marvel Multiverse is going to collapse in on itself come May with Secret Wars, I seriously doubt more Spiders is the plan. Instead I think this is just indicative of a longer-range issue fans like me have had with ASM/Superior over the past year or two; intentional or not, there seems to be a lack of awareness regarding who is Peter Parker and why Spider-Man is special. This is a character who seems to oscillate between being an impulsive, immature goofball, to being a super serious hero that can rise to any challenge he faces. I can readily accept that Spider-Man is actually both of these, but there’s no consistency or tact in determining his personality at any given moment. Instead, Peter is portrayed as being whatever is most convenient at the moment for Marvel and its creators. Mark! As a longtime reader of your site, I’m glad you’ve finally found the good sense to refer to the Rocky films. You should consider renaming this blog Chasing Balboa. Anyhoo, as someone who has agreed with many, if not all of your criticisms of the story so far, I was pleasantly surprised by this issue – thought it was a lot of fun. While I can understand you feeling underwhelmed, I think there are reasons to feel positive about the upcoming conclusion! I’m guessing/hoping that Part 6 will provide the moment where Peter will really shine. Spider-Verse opened with him on the back-foot, then showed some progression as he tried to work out a plan amidst a lot of crazy chaos (and while various other Spiders used their skills too), but surely the final issue/battle will showcase Peter’s skill and show his uniqueness. I’m also guessing that there will be a Peter vs Ock confrontation coming up based on the seeds (or Chekhovian guns) planted in this issue, which would be great. Here’s hoping next issue isn’t a big fizzer! Spot on review and you’ve nailed the issues with Slott/Marvel’s recent characterization of Peter Parker. Unfortunately the stubbornness of both those sources means future change/improvement is unlikely. He’s the least interesting character in his own book and that is some achievement. The final issue could save his arc in this story-line in the same way that the end of Spider-Island did but it will probably seem unjustified and forced at this point. If he is the greatest Spidey of them all then please show us don’t just tell us Slott..
Everyone is confident, everyone has their “serious” pants” on. Every Spider rises to the occasion and knows what needs to be done. Ben Reilly sacrificed himself, Kaine went all out and sacrificed himself, Spider-Woman went beyond the call of duty to ensure the mission progressed, Superior Spider-Man put his emotions on the side to ensure they all survive, and Peter Parker?-NOTHING! He is like a rookie way in over his head that just received his powers unwillingly and is just learning what it means to be a hero, like a clichéd story of the new hero being protected by more experienced, battle worn, heroes, all sacrificing themselves for the “one”. THIS is NOT Peter Parker, pre-OMD or post-OMD, this is not him. Did Otto take away some of Peter when he gave back his body? This Parker is a shell of the man he used to be. We all get to know a character that has 50 years of history, we can even predict how he will react to certain situations, we know Peter Parker, and this is not him. I do not care that at the very end we now see why he is the one and true Spider-Man, that all these character flaws is just to build up the “Moment” we realize he is the “ONE”, they have assassinated Peter Parker as we know him, and while I am assuming, they are doing it for the payoff in two weeks. There is a huge lack of consistency here, and it’s unforgivable, I am basically giving Marvel 3.99 every two weeks (or so) out of habit, because I do not want holes in my ASM collection. Even if there are “fun” parts in these stories, it’s all ruined to me because of the lack of direction or need for Spider-Verse. The Inheritors aren’t scary. I really thought it would have that whole “Walking Dead” feel, where they plant a seed where each story constantly stresses you out because you do not know if a character will survive, but so far it has been pretty safe, we knew ahead of time Ben would go, that a monkey would die, I am not even surprised that Kaine “died”, we know Spider-Woman will survive because of the upcoming series, Silk will as well, so I am not “Worried” that the “Bride” will be sacrificed. The problem is Slott would rather tell us what we’re supposed to feel and what the characters are acting, rather than allowing us to organically connect and come to these conclusions ourselves. It’s very shallow, Michael Bay-style writing, but sadly, that seems to be what’s selling right now. And as Secret Wars seems destined to prove, Marvel doesn’t really care about its own history anymore, only making things easier and more digestable for new readers. I imagine this will eventually backfire, as I’m sure nobody at Marvel/DC thought killing off major characters and putting foil and chrome on every other comic would ever adversely impact the industry in the 90s, but I guess lessons will be learned. What will be interesting is who will be left reading comic books when the dust settles. The shallow “tell you what you’re supposed to feel” approach is maddening and is exactly what’s ruined Doctor Who for me (yet, as you say, that’s what sells these days). Then again, Dan’s never made a secret of his appreciation for that show so I guess it’s par for the course. I just wish we could get away from spectacle and the superficial and back to some more meaningful storytelling. What is increasingly frustrating me is that the concept could be really awesome. Every Spider-Character Ever in a big Team Up story? The potential for a deep, meaninful story that explores the very idea of Spider-Man is massive. But it just keep missing the mark! As a matter of fact, the ONE Spider-Man who “cheated” to become Spider-Man is getting all the hero moments (Except for the “Big Line” which Peter demanded). I’m disappointed more in the fact that it COULD HAVE been something Amazing. While I agree with you that on paper, this sounds, at the very least, like it should be a TREMENDOUS amount of fun, the moment this story was pitched I was leery because of some of the trends involving the creator. I’m sure if Slott actually read this site he would tell me I’m flat wrong, but I have found the quality started to dip around the time Wacker left the books as editor and Dan started writing Silver Surfer. Based on his Twitter commentary, Dan is clearly not comfortable writing three issues a month – he’s not like Bendis in that way – and between that and an editor who is still learning the ropes of the book and its creators, I think a lot of what Dan does has either gone unchecked or has been slapped together without follow-through because he’s overworked. But is it better than Rocky VII: Adrian’s Revenge? So it wasn’t clear to me. Did the Inheritors kill Kaine? I missed it at first but on second read, he looks pretty dead. As dead as a clone who’s died three times already can look. Touche. I guess I was hoping for more of an emotional moment since he’s gotten face time in Scarlet Spider and New Warriors the last few years. I would say read the tie-in but this book technically takes place after Scarlet Spiders ended, so I guess those emotional moments only get doled out to Fake Uncle Ben, Otto and Spider-Man Japan. I agree with your critique. Our Spider-Man seems like he is observing while ever other spider-man gets the good stuff. Marvel keeps ruining these event stories by not having the complete story take place in the confines of the book and you have to jump from different book. The problem is then the flow is broken because the other writer and artist have different voices and style then Slott. Big things happened in Spider-Woman, Scarlet Spiders that should have been in the main book. Spider-Man is a soap opera so we should be checking in on the other cast members but Slott has let that slide to the side. He use to be great at that, which built tension, gave you something to think about and look forward to. Slott had such an incredible run up to issue 699. His humor, pacing, characters was excellent. Not sure what happened. Will be dropping all the extra books when this is done. Blah! 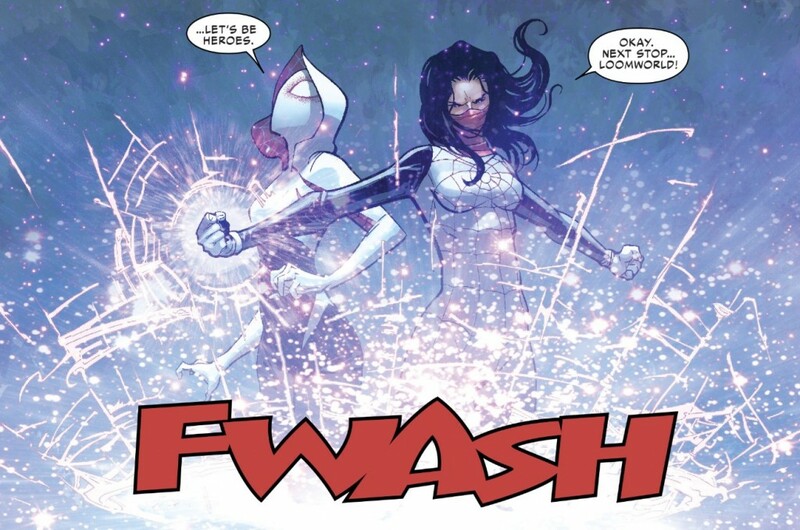 I am not even that excited by Secret Wars but we will see. Good points all around. I feel that the prophecy should have been revealed much earlier in the series. This nefarious plan the Weaver keeps referring about the Inheritors should have been laid plain issues ago. I too am exhausted by this regression in Peter.